Named a Top Hospital in December 2016 by The Leapfrog Group, a national health care quality and safety ratings group! Page Hospital is part of the Banner Health network of hospitals and clinics throughout the west. 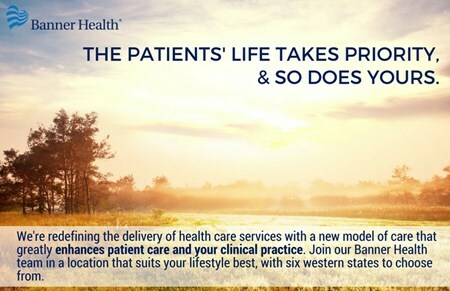 Banner Health is one of the largest not-for-profit healthcare organizations in the nation - we are financially strong and growing responsibly to meet the needs of the communities we serve. Page Hospital has served this community for more than 50 years. Page Hospital is the first hospital within the Banner Health to join the Planetree Alliance. In keeping with the Planetree philosophy, many distractions commonly associated with hospitals have been removed. Medical equipment is kept out of patient view and overhead paging and staff announcements have been replaced with the soothing sounds of soft music. Hospital rooms have couches, refrigerators, access to outdoor patios and gardens, and full-size beds draped in home-like linens. Artwork and décor is inspired by the area’s large Native American population and the surrounding beauty of the canyons and Lake Powell. Other Native American elements include a weaving loom and a traditional healing Hogan. Take a look at what Banner Health in Page, Arizona have to offer you!